The object is to connect each green dot with one, and only one, red dot (with or without overlapping paths). 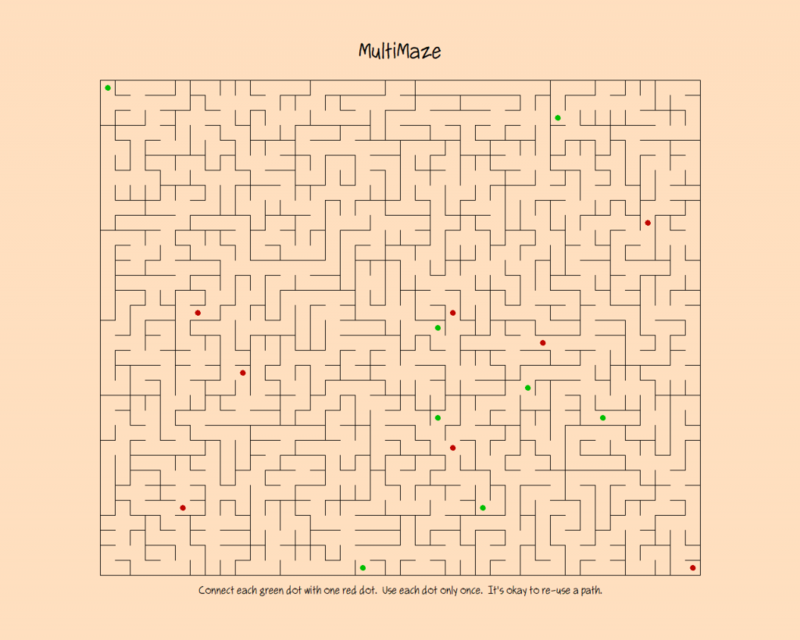 The Plain English program that generates MultiMazes is described below. We use the Aldous-Broder algorithm because it always generates a perfect maze, ie, a maze with without loops or closed circuits, and without any inaccessible areas. It is also a uniform maze generator, which means it generates all possible mazes of a given size with equal probability. And it’s a very simple algorithm that requires no extra storage or stack to implement. It’s not super fast, but it is reasonably fast, typically generating a full-page maze in less than 3 seconds. A maze is a thing with a width, a height, a cell size and some cells. a visited flag, a start flag and an end flag. A neighbor is a cell. Clear the screen with the tan color. Create a maze 10 inches by 8 inches using 1/4 inch for the cells. Display the maze with title and instructions. Allocate memory for the maze. Put the width into the maze’s width. Put the height into the maze’s height. Put the size into the maze’s cell size. Create some cells for the maze. Apply the Aldous-Broder algorithm to the maze. Select starting and ending cells in the maze. If a spot’s left is greater than the maze’s width, break. add the maze’s cell size to the spot’s left; repeat. Create a cell of the maze’s cell size at the spot. Append the cell to the maze’s cells. Add the maze’s cell size to the spot’s left. If the spot’s left is less than the maze’s width, repeat. Put 0 into the spot’s left. Add the maze’s cell size to the spot’s top. Note that the cells are stored in a doubly-linked list, not in an array (as you might expect), because Plain English does not have a native array type (arrays are not native to English grammar). Allocate memory for the cell. Put the spot and the spot plus the size into the cell’s box. Set the cell’s left flag. Set the cell’s top flag. Set the cell’s right flag. Set the cell’s bottom flag. Clear the cell’s visited flag. Pick a cell in the maze. Set the cell’s visited flag. If all of the maze’s cells have been visited, break. Pick a neighbor of the cell in the maze. connect the cell with the neighbor. Set the neighbor’s visited flag. Put the neighbor into the cell. Pick a number between 1 and 4.
find the neighbor above the cell in the maze. find the neighbor to the right of the cell in the maze. find the neighbor below the cell in the maze. find the neighbor to the left of the cell in the maze. If the neighbor is nil, repeat. A neighbor might be above, below, to the right, or to the left of the current cell. We want to pick one of those, if it exists, randomly. So we pick a number between 1 and 4 (corresponding to above, right, below, and left) and see what we can find there. If we fail to find a neighbor in that relative location, we try again and again until we succeed. After all, every cell has at least 2 neighbors. Get the neighbor from the maze’s cells. If the neighbor is the cell, repeat. If the neighbor is nil, break. If the neighbor’s bottom line is the cell’s top line, break. clear the neighbor’s bottom flag; exit. clear the neighbor’s left flag; exit. clear the neighbor’s top flag; exit. clear the neighbor’s right flag; exit. Get a cell from the cells. If the cell is nil, say yes. If the cell’s visited flag is not set, say no. We now have a perfect, uniform maze, and we just have to select some starting and ending points. We pick eight of each, almost at random. I say almost because we always select the top left cell as a starting point, and the bottom right cell as an ending point, to make sure that there is a least one long path available for the player. Set the maze’s cells’ first’s start flag. Set the maze’s cells’ last’s end flag. Pick a cell in the maze. If the cell’s start flag is set, repeat. If the cell’s end flag is set, repeat. Add 1 to a count. If the count is greater than 14, break. If the count is odd, set the cell’s start flag; repeat. If the count is even, set the cell’s end flag; repeat. And that’s the gist of the whole program. A couple of side notes on Plain English looping, however, might be helpful here. 1. When there is no explicit LOOP label, REPEAT means “repeat from the top of the routine”. 2. BREAK always passes control the first statement following the last REPEAT. If the cell is nil, break. Draw the cell with the black pen. If the things are empty, void the thing; exit. If the thing is nil, put the things’ first into the thing; exit. Put the thing’s next into the thing. draw the cell’s left line with the pen. draw the cell’s top line with the pen. draw the cell’s right line with the pen. draw the cell’s bottom line with the pen. Put the cell’s width divided by 3 into a width. draw a dot the width wide at the cell’s box’s center with the dark green pen. draw another dot the width wide at the cell’s box’s center with the dark red pen. Pick a number between 1 and the maze’s cells’ count. Get the cell from the maze’s cells. Add 1 to a count. If the count is the number, break. And that’s all I have to say about that. I’m speechless. Amazing.